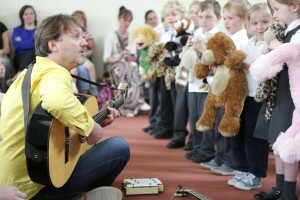 Music Generation Wicklow’s Foundation Music Programme is now running in 25 Schools throughout Wicklow. This programme is currently providing music to over 2000 young people throughout the county. The purpose of the Foundation Music Programme is to provide an introduction to music performance for young children from Junior Infants to Second Class. This strand utilises various pedagogical methods providing children with tuition in singing, percussion, rhythm, movement, games, music notation and can lead to recorder, tin whistle and ensemble playing. The structure of the Programme will involve weekly sessions of 60 minutes per class group to take the music experience for children beyond the formal curriculum in a specialist led Programme. Please note that at Junior and Senior Infants level this Programme is only recommended for half hour duration per week.